The long awaited Korean Fried Chicken War of 5th Ave. is about to commence. 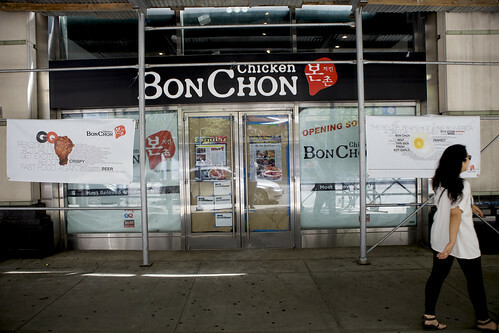 We’ve gotten word that the Koreatown branch of Bon Chon Chicken (on 5th Ave bet. 32nd & 33rd St.), just a few doors down from Kyochon’s US flagship location, is set to open some time next week and it’s not just another Kfc joint. According to the owner and manager Simon Lee, the new Bon Chon will be a completely different concept from the other more fast-foodish locations of the chain. “The classic east meets west. American sports bar meets classic Bon Chon.” That could be interesting. More details (plus my plywood peek from a couple weeks ago) after the jump. Word is that the new Bon Chon will be tricked out in plasma screens, HD projectors and a video DJ, all playing sports and music videos throughout the day. 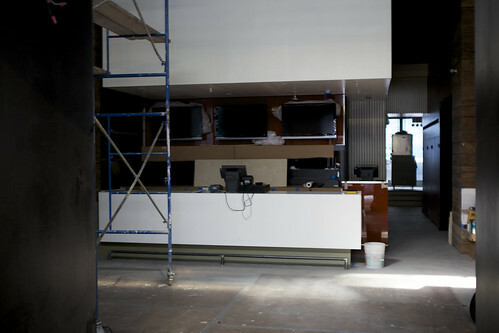 They will also be stocking a full bar and 10 beer taps. With Mad for Chicken and Kyochon as neighbors, Bon Chon is very clearly trying to compete as a bar as much as a restaurant. I’ll leave the bar reviews for Mamacita, for now we’re talking lunch. When the restaurant launches next week, we hear it will have a similar (if not identical) menu as the location on 38th btw. 7+8th, but eventually they plan on introducing stuff that you won’t find at any other Bon Chon. But what I’m most excited about is that back door opening into the outdoor space behind the building. It’s still closed to the public, and most likely will be when the restaurant opens next week- but we did hear the word “beer garden” mentioned as a possibility in the future. One day I will eat Korean Fried Chicken in the sun and all will be right with the world. Posted by ultraclay at 11:45 am, July 30th, 2010 under Bon Chon, Korean. 25 minutes for an overpriced beer? oh i cant wait! i wish they were still there at the now “mad for chicken” location! I work in 34st, and let me tell you. Korean chicken are amazing, Ah~~~~~~~~~~~~`.